Heather of Celiac Family chose 'Fish' as the theme for this week's gluten-free menu swap and the timing couldn't be better. Several weeks ago I went to a gluten-free potluck and the host of the meal made fish. It dawned on me that I very, very rarely ever made fish at home... and I wasn't sure why, because I love fish! If buying fresh fish, buy it the day you plan to use it -- don't let it sit in the fridge for days, it will become "fishy." If the fish is fresh it doesn't smell like "fish" -- it will have a slightly salty scent and even smell like the ocean. If using frozen fish -- defrost in the refrigerator overnight and use immediately -- the longer it sits, the more "fishy" it will become. So the basic key to using fish -- fresh, fresh, fresh!! Don't let fish wait in the fridge for days whether fresh or frozen. If you're new to eating fish (or feeding those "new" to eating fish), start with "white" fish varieties that don't have a strong flavor like cod, whiting, tilapia, or flounder. A good place to start with fish? Bake them. Place fresh fish fillets on a greased cookie sheet with edges (to catch liquids). Sprinkle fish with sea salt and freshly ground pepper. Add a few sprigs of dill and lemon slices on each piece of fish. Drizzle lightly with olive oil and bake in a 350 degree oven for 12-16 minutes until fish flakes easily with a fork. Serve immediately with steamed broccoli or a salad. Wednesday -- Baked whiting fish with steamed broccoli and brown rice. 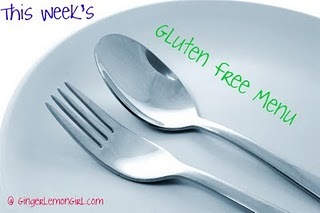 Check out more gluten-free menus at Celiac Family's Gluten-Free Menu Swap. Check out hundreds of menus of all sorts at OrgJunkie.com. Thank you heather! I agree about leaving fish in the fridge for a few days, I've done it myself and I don't know if I had bad fish to begin with or if I'm just super sensitive to smells... but I think it turned me off to cooking fish for a long time! lol... so that's why I noted to cook is ASAP! :-) Thank you so much for including me! What good timing and good tips - I try to make Monday fish night. In our house that most often means fish tacos but I can use some fresh ideas so I'll scoot over and check it out. Great info. I wish I was close to a lake like before, you can't beat that kind of fresh. I have always had the best luck baking fish. Frying is hit or miss with me though. I think I need a better fryer. With a better fryer comes more fried food, which is why I think I've held off so long. My doctor would not approve. A friend brought me some halibut she caught in Alaska. She told me to put it in the oven with a little ginger grated over it and orange juice. I don't remember if she mentioned olive oil. I might have drizzled some on. I just remember the results. Yum! I'm trying to remember who passed this little informational gem on fish to a friend, but they were told that if you don't like fish or aren't sure where to start, start with sushi. Sounds crazy, but real GOOD sushi (and sushi chefs) will use only the freshest fish so it doesn't even taste "fishy." Our sushi chef gets the best salmon in and I swear it's like butter. I always eat my salmon nigiri last as "dessert."